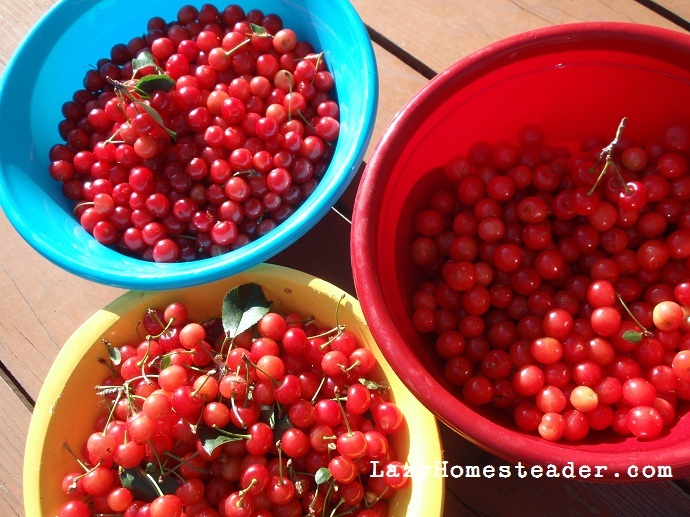 Last weekend while at my in-laws’ house, I noticed that my mother in-law’s very ripe cherry trees had not been picked. Lucky me, she told me to have at it! Rick’s younger brother, was there and he helped us pick. The cherries were so ripe that some were almost sweet. As we all picked, the adults all remembered being kids, waiting for the cherry trees to ripen (we had cherries at the house I grew up in too), thinking that this year, this year, the cherries would be sweet. I always expected them to taste like a maraschino cherry. Of course, they never, ever did. They were always sour and I was always disappointed. As a child, I assumed that these small, sour fruits were not real cherries. That they were just for birds and to look pretty. I didn’t know how good they really were. Rick, on the other hand, had some home-made pies and jams made from his backyard trees, but still most years the harvest went to the birds and squirrels, and his largest memory of the trees was putting the pits to use in his sling shot. Maybe that’s why he never thought to mention to me that his parents still had the cherry trees. Most years, my mother in-law said, they let a passing neighbor pick the trees. (!) I had been considering going to a pick-your-own orchard this year to buy some, when I noticed her trees. We didn’t even pick half of the two trees, yet we came home with an incredible haul of gorgeous sour cherries. My younger self would be so jealous of me now. Now, I know how to turn these babies into the sweet, delicious fruit that I always hoped they’d be. See sour cherries (sometimes called tart cherries) are also know as PIE cherries. (Once I tried making a pie from bing cherries. Yeah…. horrible). Sour cherries will give you a pie to die for. We ended up with eight pounds – PITTED. After washing and pitting them, I immediately put six cups in the freezer for a pie. The rest I divided between the jamming pot and the dehydrator. Dried sour cherries are pretty expensive to buy in the store. But they are delicious in baked goods, rice, salads, sauces, over pork, granola and trail mix, or just plain as a snack. 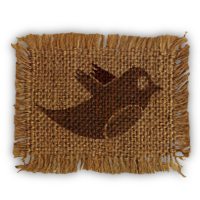 We hope to dip some in chocolate for Scott as a thank you for helping us pick. Drying the cherries was incredibly simple. 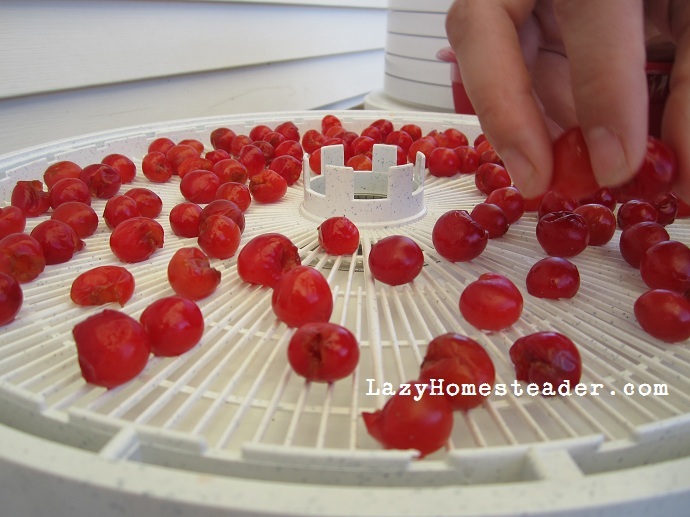 Just wash and pit the cherries, and then spread them on the rack of your dehydrator. make sure they each have a little room so they don’t end up stuck together. I tried to pick the best, most perfect cherries to dry. Any squashed or under ripe ones, I tossed back into the bowl to be made into jam. Our food dehydrator puts out quite a bit of heat, and since it has been so hot here, I set it up on an old plywood table on the back porch to do its thing. I set the dehydrator for 135° and let them dry for about 24 hours. We dried about three pounds of pitted cherries and ended up with just about a pint after they were dry. You have to watch them towards the end of the drying; you don’t want them to get crunchy. They should still be soft, kind of like a raisin. Yum. 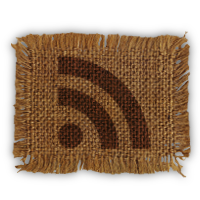 Where did you find your dehydrator? 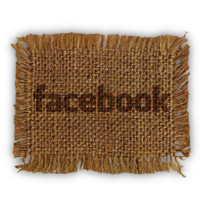 Do you use it often? 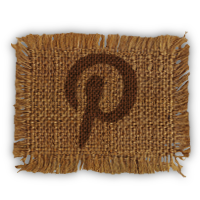 Thanks for posting! Hi Erin – it’s a Nesco – I think we ordered it from Cabelas, but I see them all over the place… Costco, garage sales, the Goodwill. We do use it often… more and more as time goes by actually. 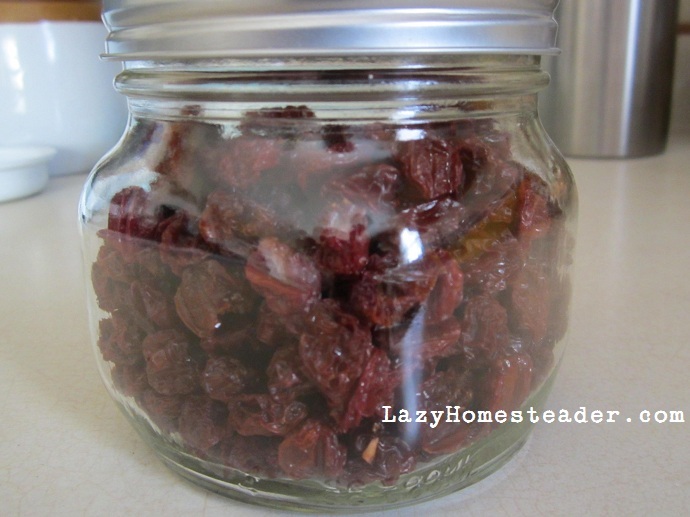 It’s great for drying tomatoes and making jerky. How funny I read this post today! Tuesday I spent the ENTIRE day canning with my Mom. She had enough cherries from her one tree to make 6 dozen half pints of cherry jelly. FYI – we live in Denver too & this spring made a bumper crop with the early growing season (no frost since march). 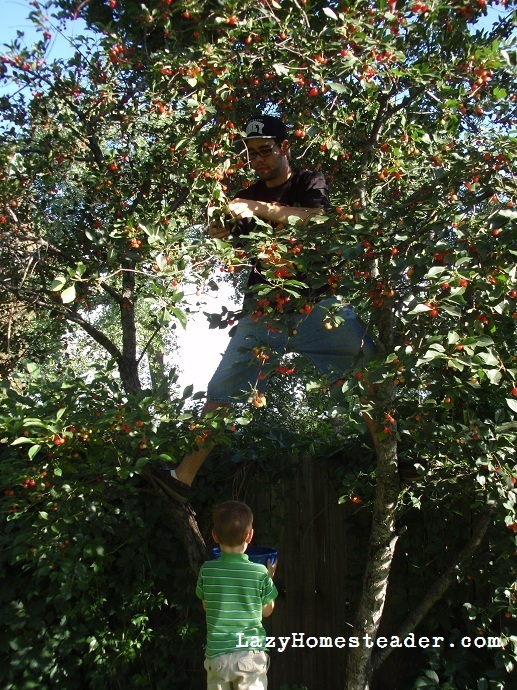 If you’re really serious about harvesting the cherries, cover the tree with netting when they start to ripen & the birds won’t get any of them. I love dried cherries, I may have to save some next year to dry! Last year we did pies. This year I don’t think we’ll get any cherries… but there’s always next year, right? Always, Annie. We actually planned to go to Berry Patch when I saw my MIL’s trees! I was so excited! It’s been a couple of years since we had cherries. This post looks like you all had such a good time!! Bill got me an apple and sweet cherry trees last week! Hopefully we’ll have bumper crops too in a few years! How I wish I had a cherry tree or a mil with one! haha.. isn’t it amazing how much fresh fruit it takes to make dried? 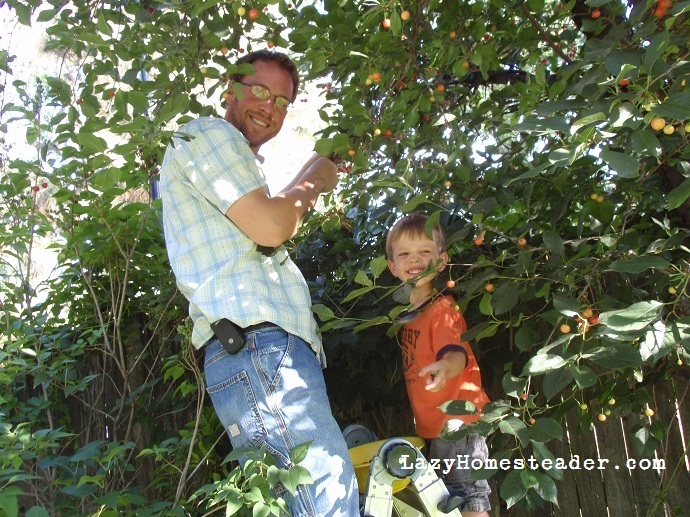 I was so inspired by this post I decided to harvest my own cherries! Thanks!!! So jealous! My sour cherry tree looked like it was going to do wonderfully. Last year I lost all the berries to birds (I assumed) so this year when the berries started growing I covered the tree with netting. I STILL lost all my lovely berries to something. sighs. I want cherries, too! 😉 Great piccies! I have two mature (50+ YO) cherry trees in my front yard, a bing and a rainier. Last year I got 50+ lbs off of the bing, and 30+ lbs. off of the Rainier. They need to be trimmed way back, as we are completely unable to reach the tops of these suckers (The bing is over 40′ tall, the rainier is pushing 50′). We have an Excalibur dryer, and a Leifheit hopper-type pitter, and are planning on drying and freezing much of what we don’t eat fresh. How I would love to have pie cherries! Oh the preserves and jams and jellies and pies and tarts I would make. I tried doing some sweet cherry preserves (they have a recipe in the Ball blue book), but I wasn’t familiar at the time with pectin and ruined about 8 pints of preserves. 😦 Whoops. Maybe I’ll try again this year, and see if I can actually put some preserves away for when it gets cold outside. Hope everything is ok- the fires in Colorado were mentioned on the BBC news, but not sure how close they are to you. Take care. Thanks Hazel – We are ok. The fires are quite a bit (about 70 miles each) to the north and to the south of us. We’ve gotten smoke but that is all where we are at. My absence in posting has been more because we are in a very full (busy) season right now for the family. A wedding, three birthdays, helping family move, etc. ! It’s kept me overly occupied and I haven’t had much time to sit and write lately. Hope to soon! That’s ok then! My US geography is a bit hazy; I knew Colorado is a big place(!) but could never quite pinpoint from the news reports where in the state the fires were. Have fun at all the celebrations! Do you think I can dry cherries that have been frozen? 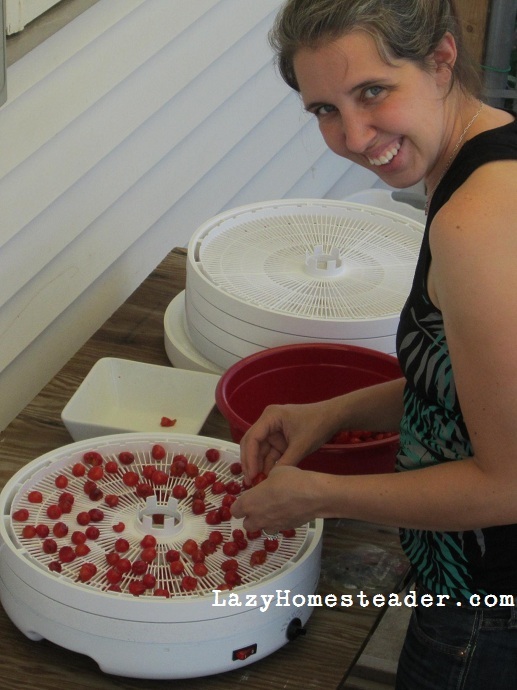 I have 20 gallons of frozen tart cherries and would LOVE to try to dehydrate some. Is that possible if they have already been frozen?